The decades-long, ferocious battle over who owns breakfast contains some intriguing (some slightly startling!) and some really very useful revelations. They form useful lessons in brand distinction and competitive advantage that are relevant to startups and more established businesses focused on innovation and growth. What struck me most about the linked article, which explores why cereal has such aggressive marketing, is one of its underlying messages: if you're after consistent and stable consumer spend for your product (or service), one of the best ways to guarantee this may be to position it as part of a consumer habit. And then maybe add a sprinkling of health benefits. In this case, that habit is eating breakfast, something long-advertised (very successfully so) as the most important meal of the day when it comes to our health and productivity. Let's face it, for centuries, health propaganda has almost always worked; combine that with something that forms a daily habit (and far beyond), and hey presto! you have a ready market to exploit, as cereal manufacturers and advertising agencies recognised as early as the 1940's. It's not just about the gimmicks or hidden toys within often gaudy packaging, although today, these undeniably help a number of the key brands vying for their share of the parent-consumer wallet in a market that has become so fiercely competitive. If habit and health are the first two factors that have helped cereal manufacturers to conquer breakfast and become the dominant food choice, then advertising has also played a big part. Even the early producers of cereal recognised the need to be creative about advertising; to appeal to their target audience where they were most likely to pay attention. Today's businesses have a far greater choice of advertising channels and approaches. Social media especially, presents an affordable, mass-awareness generating, advertising tool which can be very effective. Where the cereal advertisers of today have really been smart is to recognise that the purchaser, is not necessarily the audience to whom they need to appeal. Your target audience may not be your target purchaser. Looking at who influences your customers is essential if you're to optimise sales and to stay top of the shopping list. 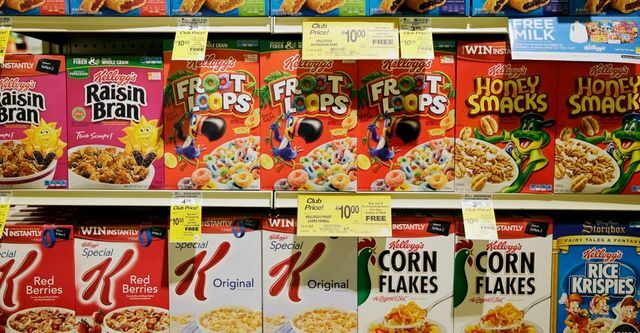 It's why (and how) Snap, Crackle & Pop and Tony the Tiger have been so successful for Kellogg's' Rice Crispies and Frosties. Generations of parents have relied on them in persuading children to eat something substantial before heading off to school. And that's another key factor: help your purchaser to solve an 'emotional' problem; here, the anxiety-motivated need of parents to do the best by the youngest members of their family and keep them properly fed and nourished. Products accompanied by characters and messaging that appeal to children and encourage them to eat what's placed in front of them has been another big factor in making cereal the breakfast food of choice. Enhancing cereal - even the most sugary ones - with vitamins and minerals and labelling them 'healthier' clearly also sells to this parent-purchaser group. Two other reasons that cereal scores so well in terms of success, are that for manufacturers, the production process is relatively simple, which means fast; and arguably, for something so mass-produced, it's reasonably low cost when compared with many other mass- processed food products. Longer storage and shelf-life also help create efficiencies and economies of scale in production and distribution. Of course, the sting in the tail is that if you're a first mover and you've done all the hard work to create the habit, engineer your market-leadership and shell out for advertising, you may not want it to be that easy to imitate you. Copy-cats might be flattering from one perspective, but for many disruptors and innovators, they can also be parasitical/cannibalistic.